This was Kaleidoscope recording under a new name, although in the interim they recorded a one-off disc - a theme tune for the 1970 Isle Of Wight Festival - using the name I Luv Wight. Indeed, Fairfield Parlour's involvement with the festival enabled them to appear as its opening act. They also recorded a live album whilst there but the tapes subsequently disappeared! The group also recorded the theme song for the 1970 film, 'Eyewitness', which starred Mark Lester, Lionel Jeffries and Susan George. A handful of acetates of the song were also made. Their first 45 as Fairfield Parlour, Bordeaux Rose, was an appealing ballad with a very commercial chorus. Despite considerable airplay the disc failed to chart. The band later reissued it in 1976 on their own label with a different flip side which was the product of a brief reunion in 1972. 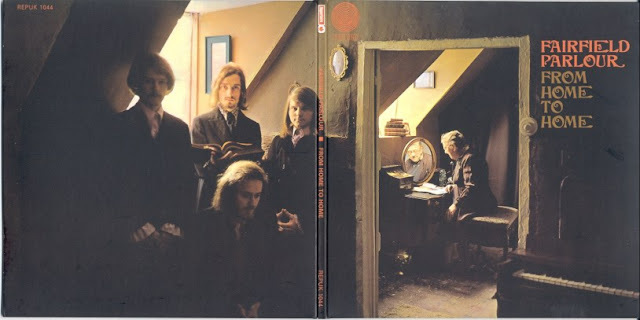 Their album, From Home To Home, was a pretty good amalgam of sixties-influenced pop (The Glorious House Of Arthur and In My Box) and sombre songs (Aries and The Drummer Boy Of Shiloh). It is now quite a significant collectable, particularly for Kaleidoscope fans. Their second Vertigo 45 contained four non-album tracks, one of which (Just Another Day) featured Graeme Edge of The Moody Blues on drums and a certain Reg Dwight (Elton John) on piano. The other three songs were short gentle numbers. The disc is now hard to find. It was also issued in a picture sleeve in Germany - these issues are more collectable. After this they parted company with Vertigo and financed the recording of a double album, White Face Lady, which was loosely based on the life of Marilyn Monroe. This remained unissued until it was finally released in the early nineties by Imaginary Records' new Triad label. One track, Nursey, Nursey, had earlier been given away free with Issue 29 of 'Bucketfull Of Brains' and an instrumental, Overture To The White Faced Lady, appeared in 1976 on the flip side to an Australian Decca release of Bordeaux Rose. The project, which featured the London Symphony Orchestra, contained arguably their finest work and is worth investigating. In My Box was also included on Vertigo Annual 1970. In the ninties, Peter Daltrey was still actively recording, with three solo albums: Dream On (Voiceprint VP 182) 1995, English Roses (Evangel Records EV 001) 1995 (Japan) and When We Were Indians (Evangel Records EV 003) 1996 (Japan). Sadly, on 1st May 1999, Steve Clarke was killed by a car as he walked across Chelsea Bridge in London.